I sleep perfectly every night!!! When I crawl in my body is just so happy it melts right in!!!! This bed was not quite to our satisfaction especially considering the price. It has air baffles to adjust the firmness and if you adjust it without someone on the alternate side it does not hold its shape when the other person gets into bed. The mattress holds heat and you better like where you place it because moving it is a small feat all by its self. I purchased my TEMPUR-Cloud Mattress almost two years ago. I love it. It is comfortable and still feels new. I have mobility issues which interfere with sleep and, while I can't say I've had perfect sleep, it's considerably better on this mattress than with others. There is no noticeable wear, and when I need to move my bed for any reason, I have no problem with this light-weight mattress. Is it better than other mattresses out there? Based on the ones I have had, yes. Would I buy it again? In a heartbeat. Comfort Knows my shape by now. I purchased the mattress with moderate pressure since hard hurt and soft made it difficult to move. After nearly 2 years, it is still the most comfortable mattress I've ever owned. Support This is a big issue for me because of my mobility challenges. While I can't say this is perfect, I will say that my challenges are far less painful on this mattress. For what I need, I can't imagine better. The reviews ask if I would recommend for couples. I'm not comfortable doing that for the simple reason that a mattress is as personal as a toothbrush. So that's something you must judge for yourself. Firmness I purchased a moderate mattress, neither too soft nor too hard. Had it exactly 21 months and it is still as comfortable as the first night I slept on it. Durability It looks like brand new. I purchased a protector with the mattress and it has worked well. The mattress looks as if I had just brought it from the showroom. This is an EXTREMELY comfortable and amazing mattress! 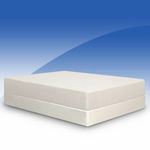 I purchased my Tempur-Pedic TEMPUR-Cloud Mattress about one and a half years ago. Let me just say, it is incredible. It truly lives up to its name - it feels like a cloud that you can just sink into after a long and tiring day. It is soft enough to be comfortable, just firm enough to support your weight. This is a perfect mattress that is easy to relax in (just try not to fall asleep!) Comfort This mattress actually sort of resembles a cloud in the fact that it is super comfortable - something that you can just lay in all day. 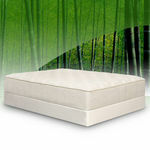 It has just the right amount of softness and firmness so that you can just sink in a bit. 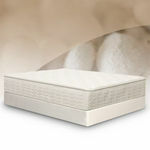 Support It sure is a soft mattress, but it has the support so that you are not just completely engulfed by it. I sleep on my side and it is great. I have tried it sleeping on my back, and it is also extremely comfortable. It has the support to keep my back straight. 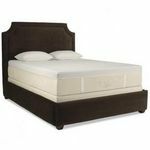 Firmness It has just the right firmness to give you the support for your body weight, but it isn't hard enough to induce any discomfort Durability it is very durable. Sleeping on this was just ok. Nothing to write home about. My brother bought one and we had to sleep on it for a little while at his house and it was just ok. He was raving about it and how he just bought the next big thing in mattresses and so maybe it was the hype, but it didn't really do it for me. Comfort I didn't really find it anymore comfortable than my regular mattress with a 3 inch memory foam topper on it. Just saying. It wasn't bad or anything - it just wasn't what I was anticipating. Support A little too supportive for my taste but if you have back problems this might be a good fit for you. Firmness I thought it was very firm. I anticipated it being softer - maybe its just me. I guess if you like a firmer mattress this would work for you. Durability Can't really comment on durability as I just spent about a week or two sleeping on it. I suppose its durable if it can put up with my brother and his friends playing videos games sprawled out all the time. I had heard so many good things about this mattress that I decided that I should try it out myself. I am a side sleeper and this mattress was very comfortable for me. It truly contoured itself to my body and I felt rested. However, my husband is an all-over sleeper (ie on his side, his back, his stomach) and he said that it felt too soft for him. Also, it was extremely hot for him due to the foam. We tried the mattress in the summer and, coupled with the environmental heat, we were both sweating throughout the night despite taking off all the blankets on top of us. Also, because the mattress contours itself to your body temperature, the mattress became even softer during our trial in the summer and it was not comfortable any longer for both of us. Lastly, the mattress is extremely heavy! We are both in pretty good shape and it is difficult to change the sheets on this mattress due to its weight. So, unfortunately if you have a back problem, I would not suggest that you purchase this mattress since you may injure your back when changing the sheets. We ended up returning this mattress and purchasing a regular box spring mattress. My husband and I both suffer from back problems, even at our ages. I have lower back pain and my mattress plays a huge roll in my overall health. We purchased a TEMPUR-Cloud mattress years ago and to this day I do not regret our decision. Over time this mattress breaks in and is more comfortable than when we first bought it. At first I found myself having restless sleep nights because it was too firm. I considered taking it back within a week of purchasing it and talk with the salesperson. He said that this mattress has a "break in period" and I hesitantly went with that answer and gave it another shot. Within a few weeks my body adjusted to this high quality mattress and I'm glad I gave it a chance. Now I wake up refreshed in the mornings and my back has minimum pain. The material of this mattress is high tech and built to support and adjust to my body. I like that I don't have to flip the mattress to get better support, and the TEMPUR-Cloud is allergen and dust mite resistant. I feel that if I spend half my life sleeping I should get one of the best mattress so I'm comfortable. My body and back thanks the TEMPUR-Cloud because it has made a huge difference in my overall well being. Comfort It's a very comfortable bed. It took me some time to get used to it but in didn't give up and thankful I didn't. 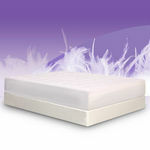 Support Excellent support, it blows me away at how many years I slept on a spring mattress. 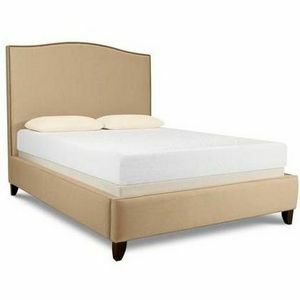 Firmness Firm but soft at the same time, hard to describe but once you lay on this mattress you will see what I'm saying. It's a comfortable firm mattress. Not too hard but just soft enough. We bought this mattress thinking we would be loving it for the next 5-10 years. When we first bought it the chemical smell was SO overwhelming. We were told it needed to 'de-gas.' I am really hoping that was not toxic for my husband and I- but the chemical smell lasted for about two weeks, then I guess we got used to it. We loved this after the chemical smell dissipated, however, if you are a hot sleeper- this bed is NOT for you. Fast forward 3 years and we have indents on both sides of the bed- and we are average sized people- definitely NOT overweight. These are supposed to never get dents- but it did. In order for the warranty to cover the mattress you have to return it at your cost- not worth it. If purchasing- just know that it will need to be replaced sooner rather than later. The foam breaks down where there is the most pressure/weight and turns into holes. Comfort The Tempur-Pedic Tempur cloud was very comfortable when we first bought it. I just loved it. After owning it for a few years there are some dents in our normal sleep spots and this is very uncomfortable for my husband. I am not as bothered by it as him. Support Excellent support on these mattresses for the first few years. The foam WILL break down and become less dense where there is pressure- than the spots without pressure. Firmness This was a prefect choice for my husband and I, he prefers firm, while I prefer soft. I think that is is a good balance for a couple, soft enough for me and firm enough for him. The foam does break down over time. Durability This is a good mattress, but I did expect it would maintain it's firmness and quality beyond 3 years. 1 Year and still not loving it.